I love challenging my self to get a new hair style whenever I feel bored. And lately I just colouring my hair with extremely "lovely" colour, which is brown & pink. 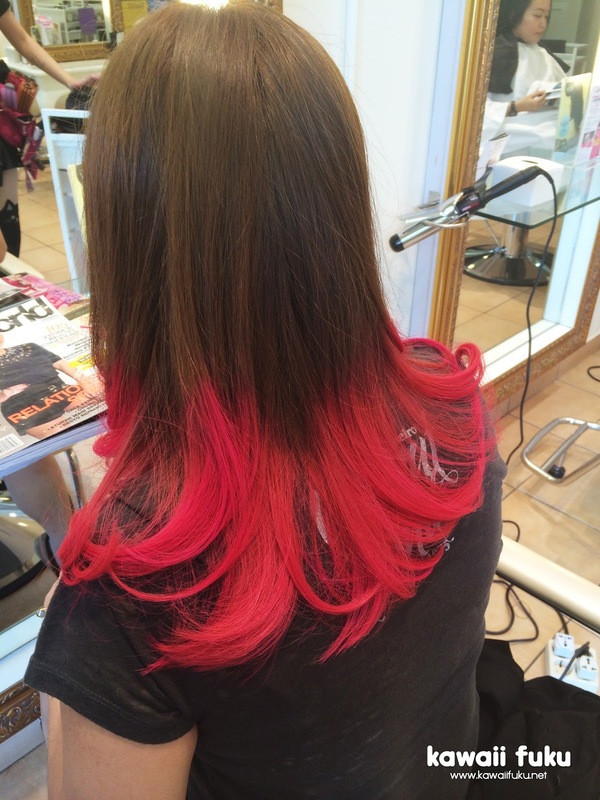 Though some friends said that I'm crazy enough, but I got many compliments about my new hair. I also get so many questions about it. Where did you colouring your hair? How much it cost? How's your hair condition after that? So, I decided to tell you about my new hair now, on my blog. For those who asking me about my new hair, you can get the complete answer here. One day, the idea of having pink hair suddenly pop out in my mind. I know it sounds ridiculous, but it's true. And at the moment, my boy friend just told me that One Piece Hair Studio was having promotion on groupon. 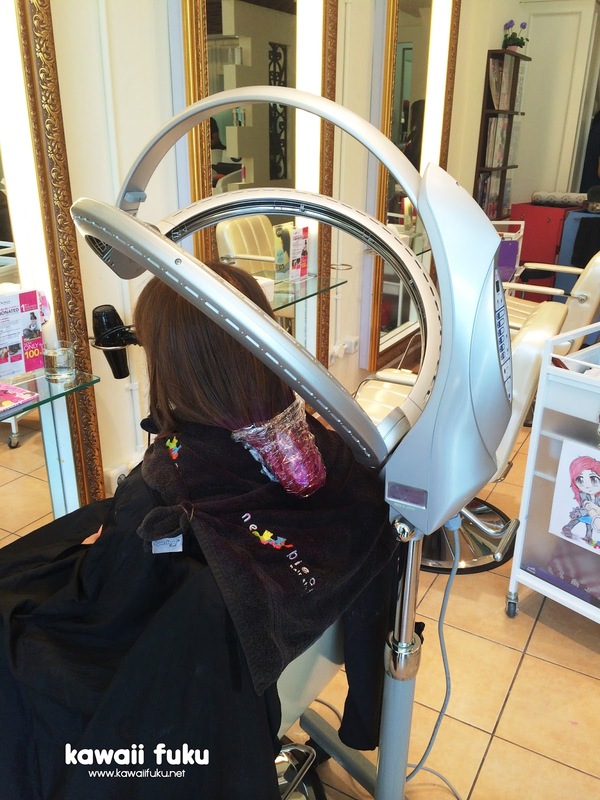 It has almost 50% off for hair colouring / perming / rebonding. 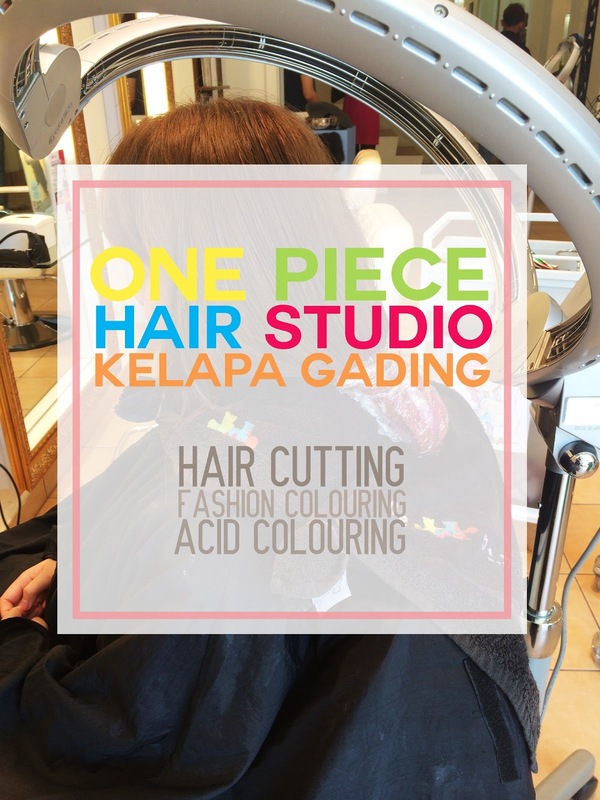 I know I can't miss this promo, so I bought the coupon and book a schedule at One Piece Hair Studio Kelapa Gading. So, for those whose asking about the price, now you know that I firstly bought a promo on groupon so I can save some money. So I decided to change my booking to Ms. Pipit. I had cut my hair with her before, so I trust her to do my hair again this time. 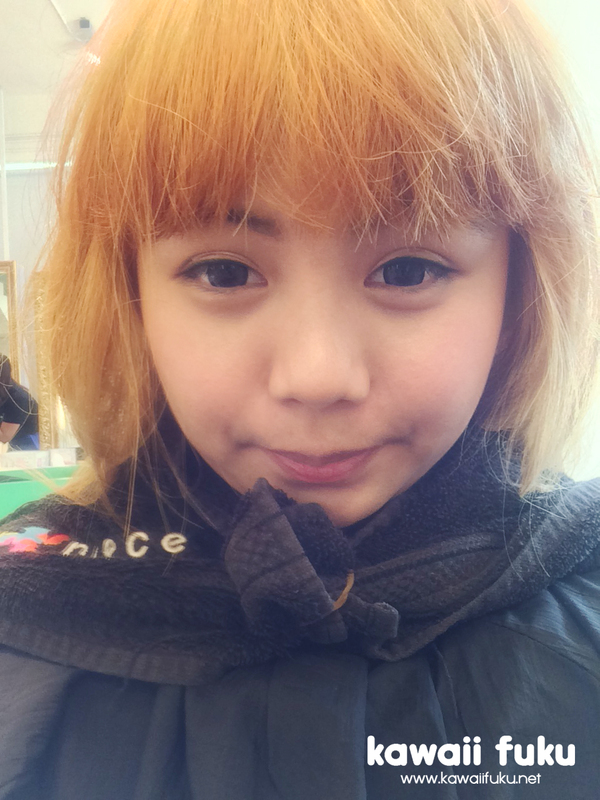 Yes, I've bleached my hair a few days before I came to One Piece Hair Studio. If you have tight budget, you can bleach your hair at home first. But make sure you bleach your hair properly and evenly. Or you can go to another salon which can bleach your hair professionally with cheaper price. I've bleached my hair (1x bleaching before I go to One Piece Hair Studio) at my mom's friend's salon and it just cost me IDR 200.000,-. Bleaching at One Piece Hair Studio will cost you IDR 780.000 for long hair. And from many reviews I've read, they'll bleach your hair twice and it will cost you double price. Basically bleaching is just a same thing, everywhere with any price (in my opinion). Bleaching will make your hair dry (or super dry if you have thin hair strand), so prepare for the risk if you decided to bleach your hair. So far, I've bleached my hair 3 times (twice with professional and once done by my self). My hair was very dry after bleaching and I should do deep conditioning before I start to colouring my hair. So, I never bleach and colouring my hair at the same day. 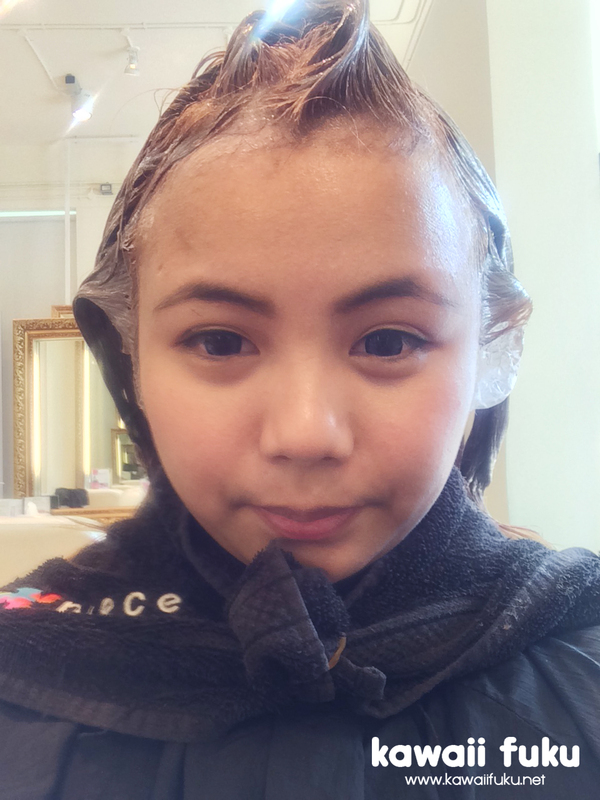 I explain about this "bleaching thing" because there are so many people who asked me about the bleaching process. Most of them were asking how many times my hair get bleached? How much it costs? So, I decided to answer those questions completely in this blog post. Thank God, Ms. Pipit knew that I've bleached my hair and she decided not to bleach my hair again. 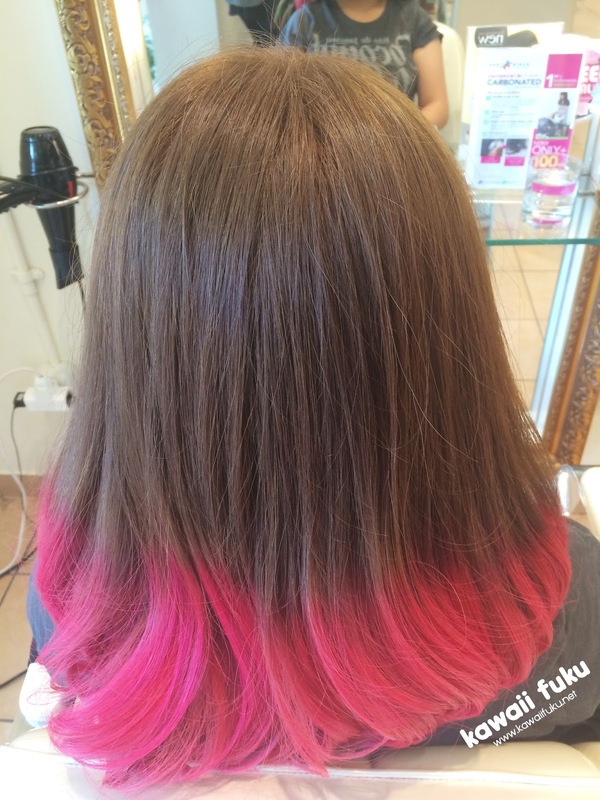 She just said, the bottom part of my hair still need to be bleached so the pink colour can show up. She warned me that the bleaching and pink colouring price won't be included in groupon promo voucher while she examine my hair condition. I said "It's okay. I still want this and I know it won't be included in the groupon promo voucher." It's so nice when she told me about this, so the customer will know (and not shock when they see the bill) that they will get charged for another treatment that excluded from the promo voucher that they bought. And then she gave me the colour chart book and let me pick the colour. She also suggest me some colour that will match with the pink colour, but in the end I pick the colour by my self. Because who knows your self (and your desire) better than your self? From my deepest heart, I want a brown and pink hair. 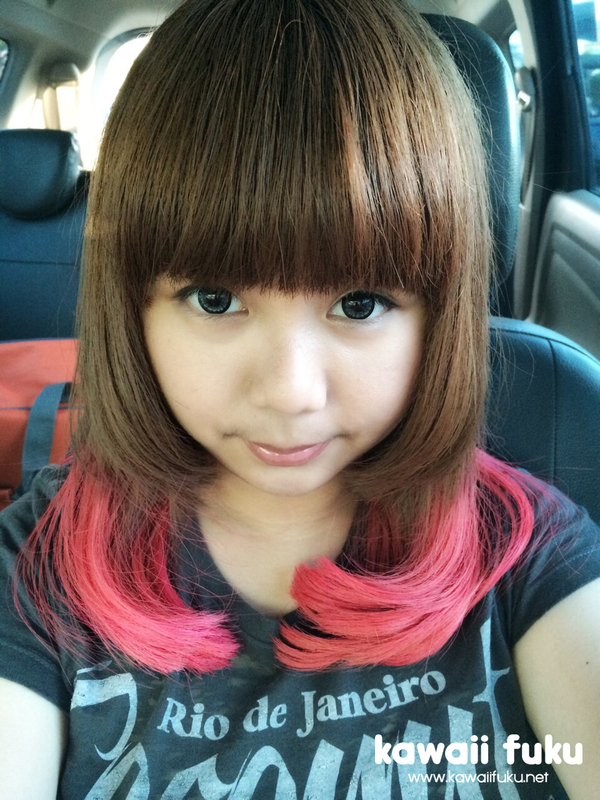 So I choose a beige brown colour for the upper part of my hair and bright shocking pink for the bottom of my hair. After that, I was escorted to wash my hair. I decided to using Carbonated Water System so my scalp and my hair will absolutely clean from any pollutants and chemicals. This will cost you IDR 100.000,- for twice (if you had colouring service) and once (if you had only hair cutting service). And the photo above was taken when Ms. Pipit and Ms. Nadya (stylist asst.) just finished colouring the upper part of my hair with brown beige colour. After waiting for about 10 minutes, I was escorted to wash my hair again (not using CWS). And then they dry my hair and start bleaching the bottom part of my hair. I waited for about 15 minutes and then they washed my hair again. After my hair was dry, Ms. Pipit and Ms. Nadya were starting to colouring the bottom part of my hair with pink colouring paste. And then they wrapped it using plastic wrap. Then they place a heating tool near my hair. 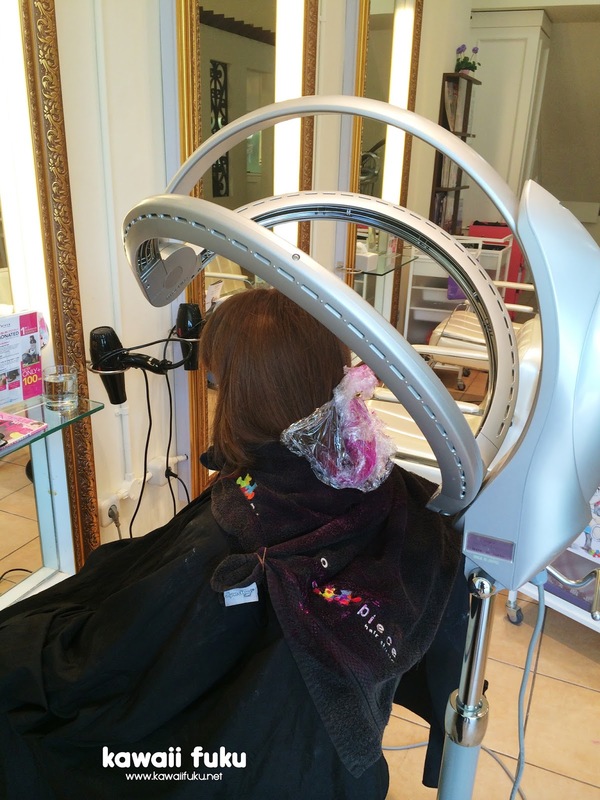 This tool can make your hair absorb the colour faster. After 10 minutes, Ms. Pipit and Ms. Nadya were giving some more colour paste on my hair. And then they wrapped it again with another plastic wrap. As you can see on the photo, that I have double plastic wrap. And then they let the heating tool to do its job again. This time they set it for 30 minutes. After that, I was escorted to wash my hair and this time Ms. Nadya using CWS (again). And this is the result after Ms. Pipit and Ms. Nadya blow dry my hair. One thing that I love from Ms. Pipit is she loves to curl your hair in a perfect way. For those whose asking me about how much I paid for my new hair, here's I'll give you the price list. I'll give you the total price that I paid to get my hair done. FYI, I paid it by my self. I'm not being sponsored by One Piece Hair Studio. 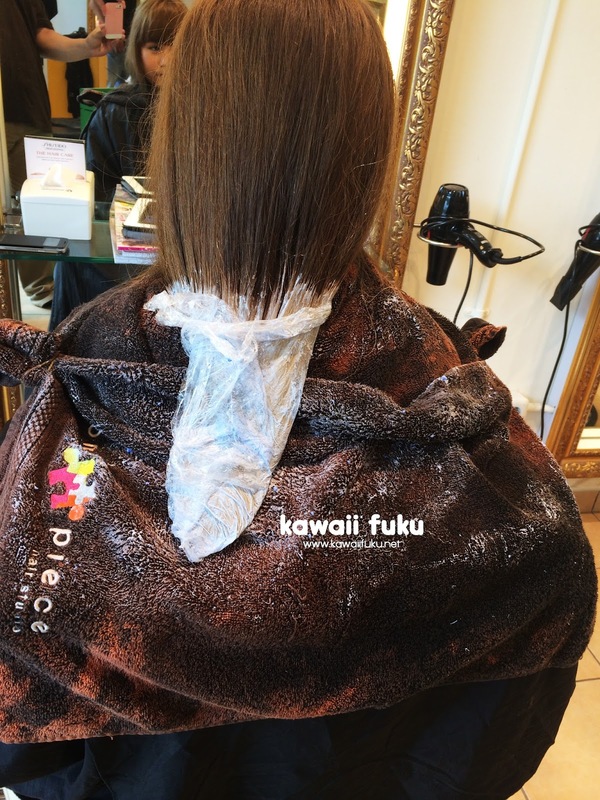 At last, I hope you love to read the story of my new hair and I hope this will help you if you want to get your hair done at One Piece Hair Studio. I already give you the complete price list, since I got many questions about the price.